Slab of marble inscribed on the face and down the narrow left side (130 x 30 x 6 cm). The stele was found at the village of Alonia, near Pydna. This association consists of citizens, non-citizens, and slaves, as well as both men and women. For good fortune! In the Augustan year 282, which is also year 398, on the eighteenth day of the month of Daisios, in Pydna. The convened worshippers (thrēskeutai) of the god Zeus Hypsistos (“Highest”) decided to set up this monument (stele), when Urbanianus Vilistus was auditor (logistes); Aurelius Nigerion was leader (archōn) under the head of the synagogue (archisynagōgos), Aurelius Kepion, formerly called Pierion; Aurelius Severus was president (prostatēs); and Aurelius Theophilus, formerly called Pierion, was secretary (grammateus). The rest of the worshippers are inscribed below. Prosper! Aurelius Erotianos, Aurelius Boethos, Titus Octavius Zosimos, Atanius Tatianus, Aurelius Trophimos, Claudius Philoumenos, Aurelia Sabina, Aurelius Artemidoros, Aurelia Parthenope, Aurelius Elpinikos, Titus Flavius Julianus, Titus Aelius Julianus, Cornelius Ophelion, Philocuris the household manager, Eleusinis the house-slave, Claudius Ambrosis, Aurelius Epagathos, Aurelius Alexandros, Aurelius Kopryllos, Cornificius Kallimorphos, Antonius Paramonos, Aurelius Poluxenos, Aurelia Atheno, Aurelius Herakleides, Aelius Philo, Aurelius Maximus, Aurelius Theodoulos, Aelius Kalophronios, Aurelius Leontiscos. (On the left side of the stele) Through the agency of Theophilus and Aurelius Kepion, formerly called Pierion. δει’ | ἐπι|με|λη||τοῦ | Θεο|φί |λου | κὲ || Αὐ|ρη|λί|ου | Κη||πί|ων|ος | το|ῦπ||ρὶν | Πι|ερ|ίω|νο||ς. 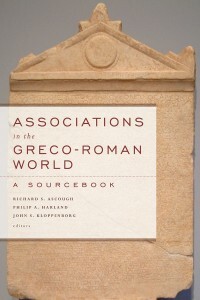 AGRW 45: Pydna Membership List, now in Dion museum. GRA I 72 from Pyda.